If you are looking for an alternative to the traditional wooden or stucco staircases, precast staircases may be the right option for you. Our iron precast staircases are permanent fixtures that are crafted using blueprints and engineering plans that conform to Uniform Building Codes (UBC). Upgrade the look of your staircase with a reliable investment that will last for many years. 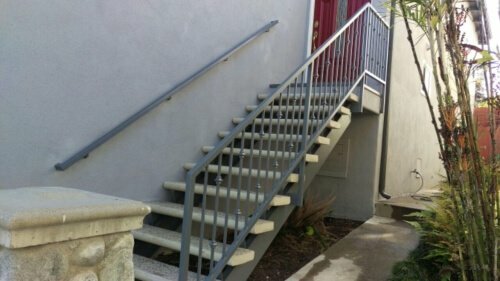 Capital Deck & Stair has over 30 years of industry experience installing precast staircases to homes and businesses all across Los Angeles and Orange County. We are trusted for our skilled craftsmanship and excellent service delivered by certified professionals. Our team can provide prompt service and perform our installation with little disruption to your daily routine. We can discuss the custom specifications for your staircase, the various designs available, as well as your coating options. Our professionals can also evaluate your structure to determine whether it is suitable for precast railings. We can walk you through each step and explain the entire installation process, as well as how to maintain your new staircase. If you would like to schedule a free estimate, contact us today. A professional from our team can come to your door and provide you with a cost estimate as well as a project time frame. We have experience servicing apartment buildings, homes, commercial buildings, and many other properties in Southern California. Let’s start your project today. Call (818) 697-6334.